Burdekin River near Ayr at Homehill. Water, Ayr and Home, I am sure poets would do something with that offering. This is a covered bridge like used to be in Nabiac. Being that this is the dry season we have seen more sand than water in many of the other rivers, but this one is major and full. Over Johnstone River coming into Cairns. Joseph Mcavoy Bridge. I finally get a pen and paper to preserve the name. Some indications that he may have been a keeper of the bridge from sugar cane growing areas in late 1800s. But this could just be someone with the same name. Other noteworthy items include crocodile sightings upstream and that major road works are happening. No surprise on the croc thing, it’s close to the coast, wide and with mangrove banks. Same, same over Mulgrave River, also coming into Cairns, near Gordonvale. This time named for a Desmond Tranamore. This time I am able to google that he was a police officer, killed in the line of duty in 1964, at the cost of $48 million this girder bridge replaced the low-set bridge, at an increase height of some 5m. Understandably many of these bridges used to flood in the wet season, people in the early 1970s used to say, ‘if someone spits upstream the Bruce Highway floods’, things have improved since I lived in Brisbane with my first husband. Lucky not in flood for us. Over the Barron River multiple bridges. We crossed this river in Kurunda, Mareeba and Malanda. Each bridge equally as impressive with height between water and roadway. I think they have floods up here. We were both on the Captain Cook highway and on the way into Freshwater for these crossings. Over the Annan River Bridge and causeway – Near Keatings lagoon. Kakadu like wetlands. Labeled with a “Big Annan Bridge” sign, but is really an old ‘pick a plank’ wooded construction with roadway covering. The car jerks across, with us wondering what would happen if the tyres get caught in a gap? The causeway has a chasm at the top of some falls, and is made of sections of concrete. We are really heading in the beyond. Before Palmer River Roadhouse North of the Bverstown Range and lookout. Workmen and stock the only other moving things. Called a development road , heading towards Cooktown on the inland sealed road. Rollo Gallop Bridge was it a gully or waterway? Rivers in this area flow into the Gulf of Carpentaria. The river has steep sides with minimal water, but flood flotsam is in the trees. WA registered caravan waits while we cross (The bridge is only single lane.) In the roadhouse is a museum filled with tales of people and how they traversed the river and travelled in past decades. Even this river can flood. Harold’s Townsville. German (European ?) girls serving behind the counter, seem to be learning. Specials – Barramundi and salad (crumbed), huge fillet but it would be better not crumbed. Reasonable salad, but we did not expect chips as well. 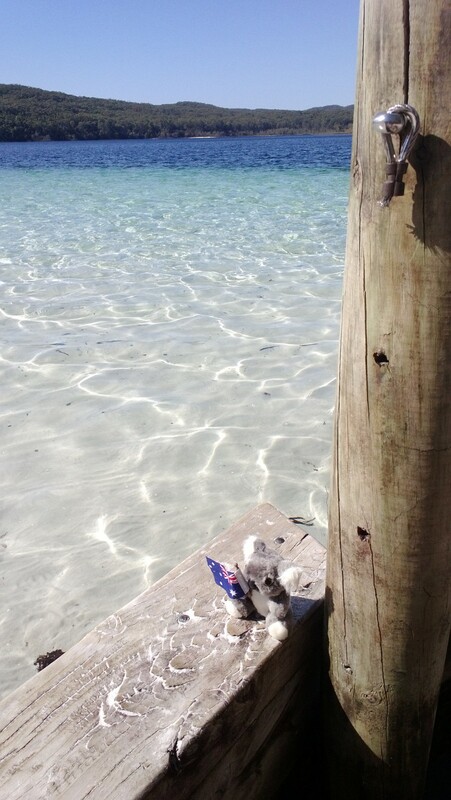 Good value, but not as cheap as Saviges Bribie Island. My grilled offering is a tiny fillet. Rod has to ask for lemon, tartare sauce is 50c a sachet. Horseshoe Bay Fish and Chips. Magnetic Island, off shore from Townsville. Spanish Mackerel which seems to be the fish and chips basic offering up in FNQ, sort of like Flake is to Victorians. Much better than Harolds in town. Fish and chips $10. They offer a fish burger with choice of grilled, battered or crumbed. $3.50 for serve of chips, which is huge and double wrapped. A sign says, “Best on Maggie”, you’ll hear me shout! Ironic because a deaf lady takes the orders, which you indicate by pointing. Beachcomber Caravan Park South Mission Beach. Piece of fish $8.50 minimum chips = $4.50 that are too many. Opt for fish burger, choice of the lot – bacon, cheese, pineapple, beetroot, and onions. Brilliant meal and better value than the more classic F & C $10.30. They use Spanish Mackerel, lightly crumbed. 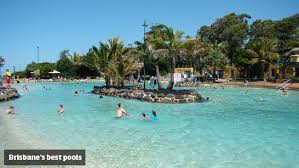 Disappointingly we could not find any fish and chip shops open near the Cairns Lagoon, to have a water-side picnic. Nothing had take-away, it was all posh sit down jobs. Trinity Beach Bar N Grill. Sampling from the menu – Pig dog pork riblets… bacon and cheese $7.50. Sure these must be good for you. Spanish Mackerel $8 a piece, $11 if you have fish and chips. With lemon and tartare sauce. Thick yellow batter. I decide to compromise in an attempt to lose weight and opt for grilled, a very small, dry piece was the offering. Grill’d and Gutt’dCooktown. This little establishment gets our vote for the best, most perfect brown grilled fish. We pick Barramundi $9.90 – we have just been fishing for this delicacy out on the river, and know they are locally caught because three didn’t make it into the boat. Served with lemon on a bed of rice, why? ‘To keep it moist’, but offered up with plenty of “don’t know” looks. Great salad. Chips were a bit limp, ‘not their fault’, says Rod. They were left in their paper while we ate the wonderful fish. The meal cost us $30 for two, reasonable considering the quality. The waterfall Mecca of Australia has been reached. The Atherton Tablelands! Up into the hinterland from the wet tropics, I guess they have no choice but to feature tumbling waters. 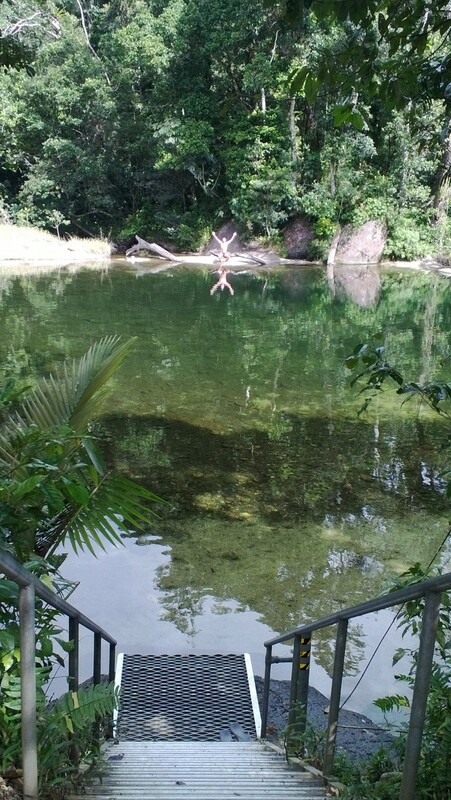 Malanda Falls: Crashing into a pool at the base. Top marks on two categories, the volcanic rocks that are wearing at different rates, and the fern strewn surrounding rainforest. These falls have a web site – www.malandafalls.com , plus a spanking new visitor’s center. This location has been on the tourist trail since the 1920s, where locals would come for a safe swim up in the cooler, not stinger infested hinterland. Millaa Millaa Falls: Part of the Trio for falls. We have struck waterfall pay-dirt. The trail has very slippery steps. 183m drop, 800m above sea level, they get 2-3m rainfall annually, and so no surprise the streams wear down gullies and make waterfalls. Some steep car access, slippery roads to add to the danger/amusement factor while we watch people in campervans try to park closer to the base. Impressive basalt columns, draws the number of tourist buses which add to the entertainment watching them try to turn in the full postage stamp sized parking area. Zillie Falls: Viewing area at the top drop-off point is mud strewn and only really affords a glimpse of the power. It doesn’t seem as dramatic as the others. Ellinjaa Falls: The last one we encountered on the day trip out of Yungaburra on the Atherton Tablelands. We had to clamber down hobbit steps and trail switch backs to reach the viewing area at the base again. There is yet another problematic parking area, with carnivorous potholes and block of flats on wheels campervans to deal with. 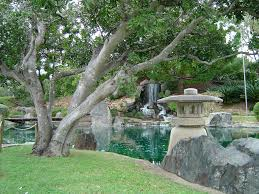 Japanese Gardens Rockhampton. Part of the Botanical gardens we stumbled upon after reading the tourist information. Aside from the steak dinner, or playing spot the giant bull as we drove around town what other things were we going to do in Rocky? It did take us some time to locate the Japanese Gardens, confused by the map’s orientation and lack of signage. Our response: the water should be cleaner. Eriskine Falls Otway National Park, Lorne. (featured image) While this might seem to be right out of the FNQ region I blame the way my notes are put together, and I am lobbing it here regardless. An impressive 38m drop. Giant tree ferns seen from above as we descend to the viewing platform look like lace umbrellas, with multiple levels of lookout. 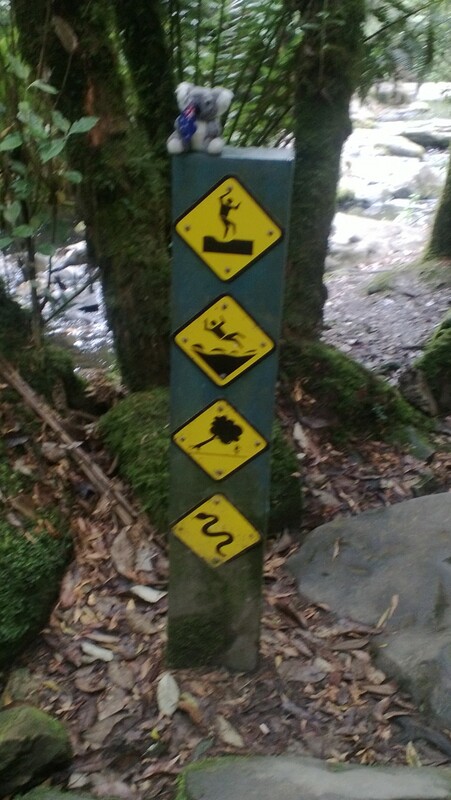 At the lowest one signs warn of ‘Dangerous terrain beyond this point: Experienced bushwalkers only.’ This warning is reinforced with universal symbols which show the potential dangers. Look out Kenny! A short and sweet category that was meant to match our experiences with the hot pools of New Zealand, but somehow faded off. These are a few of our noteworthy 2014 experiences. We have had some unique place in which to submerge. 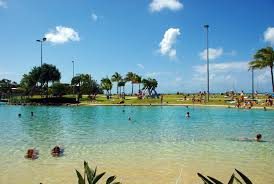 Redcliffe Lagoon. On a clear day you can see the towers of Redcliffe from Bribie. It’s the departure point for the ferry to Morton Island (another Queensland sand island), strong triathlon club, used to be serious working class, now due to bayside status going more up-market. This pool complex is in the South Bank style. Plenty of features which make it look as if Redcliffe was built first. Lots of deep water areas. Kiddies play area all clean-treated water. Lake Mackenzie. A perched lake, not one with Perch there-in, but sitting above compressed sand. The base has been pressurized and become solidified with vegetation over time. The water layer sits on top. This sand has a high silica level and we use it to exfoliate. Gold jeweler comes out sparkling. There is a chill, sharp wind, but warmer in the water. The Lagoon. Airlie Beach. Various depths, an area with a blue line on the bottom for those who simply must swim laps. Lots of lawn and sand on which to sunbake. Essential resource as this area is a no swim zone due to the presence of stinger jellyfish between November and May. Signs warn of the ‘risk of encountering toxins’ bottles of vinegar which are supposed to ease the sting are on warning plaques. The life guard is full of anecdotes about fights between itinerate back-packers. A tropical pool – what could be better. When asked about the water temp his reply was, ‘want the real temperature, or the one you’d prefer to hear’. Rod thinks it’s about 18 C degrees. 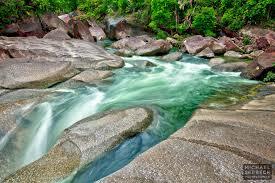 The Boulders, Babina Creek, south of Cairns. Deep cool magic ponds. Signs along the walk warned of the dangers, but swimming is possible in certain areas. The reflection factor was amazing. A mirror-lake-waterway amongst the rainforest. Everyone kept asking, ‘is it cold?’ Sure, but we kept swimming just so we could say we had this outstanding experience. Lake Eacham, Atherton Tablelands. Swimming in a crater lake! Another one of those “because you could” swimming experiences. We had to swim there because it was so spectacular. A few brave souls were sharing the pleasure, but this will always be memorable because of the exchange with a relaxing bar-staff worker. ‘Is the water warm,’ asks Rod. ‘It always warm, it’s a volcano.’ Her knowledgeable reply. Into Redcliffe Lagoon Pool – A manufactured tumbling waters sends out feelings of the waterfalls in Napier’s Botanical Gardens. Including a little bridge, such a common feature on this type of fall. Users face no climbing or swimming restrictions. 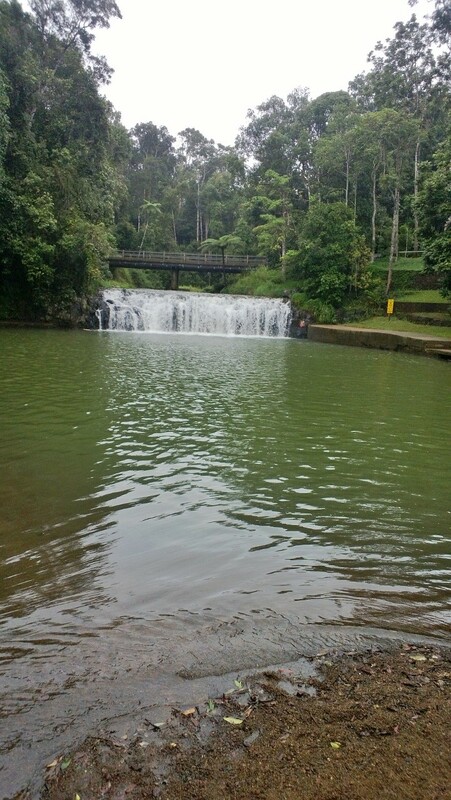 Gardiners Falls – Maleny, Sunshine Coast Hinterland. The swimming pools on the banks of the Obi Obi creek. The steepest downhill access road since we drove into apple orchards in the Huon Valley, at least this road was sealed. 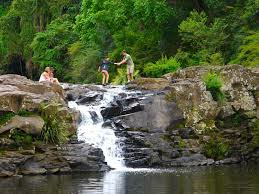 The guide documents, ‘short level walk downstream to falls with popular picnic spot and large pool at the base of falls. 1km, 30 minutes.’ Yet signage at the car park says, 300m: just who to believe? The picnic spots all seem under big, shady trees, and we are inclined to chase the sun. There are rope swings and many jumpers to risk the freezing waters. Including an excited cattle dog that, ‘followed me home from the pub, one night.’ The young owner tells us. The Boulders. Same day trip. 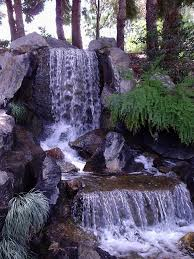 Technically is this a cascade, rather than a waterfall, but I am including it here. There is an aboriginal legend about a disobedient woman who was in love with a younger man and not the elder to which she was promised. So she ran away. She was brought back to the tribe but fled again. She tossed up rocks into the stream, and here spirit is still there to trap unwary travelers. I find this eerie as there are also records of deaths in the area. Everywhere is strewn with signs of slippery rocks, and the potential for death and injury. Water tumbles into chasms under the rocks. Like the waterfalls we encountered along the road from Te Anau to Milford Sound on NZ’s south island. The colors are amazing.